Born on July 25th, 1920, in Notting Hill, London, Franklin grew up in an influential family of Jewish descent. She excelled in science throughout her early years and at the age of 15 she realized she wanted to become a scientist. Eventually she graduated in 1941 from Newnham College in Cambridge. As a woman, though, she was not permitted to receive a proper Bachelor of Arts, so Franklin was awarded a titular degree (titular: all name, no substance). In 1945 she earned her PhD at Cambridge University. She worked briefly for the British Coal Utilization Research Association, studying the porous structure of coal. At the Laboratoire Central des Services Chimiques de L’Etat in Paris, France, she learned a fair amount about X-ray diffraction. Franklin moved to King’s College London in 1951 and began work on DNA fibers with Maurice Wilkins and Raymond Gosling. Unfortunately, Wilkins was away when Franklin first arrived at the lab, so upon his return he assumed she was a lowly technician. The mistake was understandable given the times (women were a rare sight in her station of science), but the misunderstanding created a lasting tension between the two colleagues. 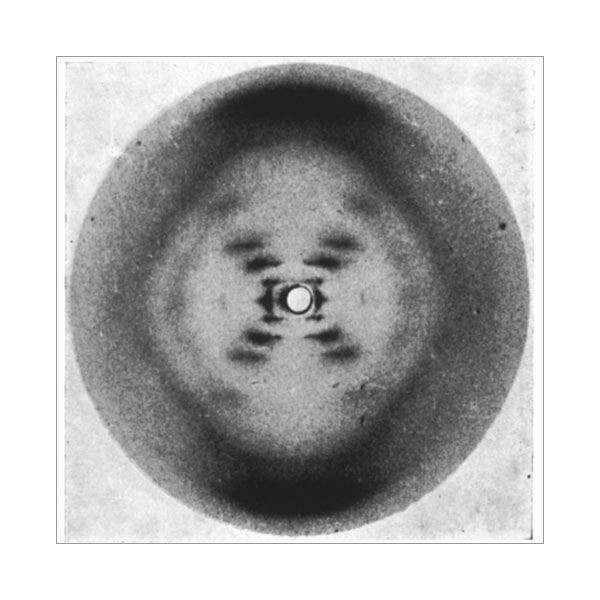 Rosalind Franklin’s most famous piece of evidence is this image: Photo 51. It depicts an X-ray diffraction of DNA. Taken in 1951, the image eventually led to the conclusion that DNA was composed of a double helix. Such a structure consists of two helices (corkscrew structures) running in parallel. In 1953, James Watson, an American molecular biologist, visited King’s College in an effort to collaborate with Wilkins. When he arrived, Wilkins was not in, so he pressed Rosalind Franklin to share their research. She refused Watson, but on his way out, Watson bumped into the returning Wilkins. The two shared a mutual respect and Wilkins allowed Watson to see Photo 51 (unbeknownst to Franklin). One month later, Watson and his partner Francis Crick began constructing a model of the DNA double helix in their own labs at Cambridge. After another month, they completed their model and proceeded to publish in Nature, one of the top scientific journals in the world. It is widely held that even though they only had the barest details about Franklin’s work, it was a sufficient amount to construct the model. Without her data, the discovery would probably have been delayed for some time and potentially have been made by some other scientific team. Wilkins went on to publish more papers with Watson and Crick, but Franklin received only a small footnote in the first Nature paper. Shortly before the helix model was completed, Franklin moved to Birkbeck College and began research on the tobacco mosaic virus. The virus was (and still is) a constant pest to the tobacco industry. Her research moved toward RNA and other RNA viruses. While she accomplished a fair amount in this time, it was her last big project. In 1956, she was diagnosed with cancer. Several surgeries ensued and she was in and out of the hospital until 1958. During her time of illness she still managed to publish a number of papers and worked hard in the lab. Sadly, she succumbed to ovarian cancer on April 16th, 1958. In 1962, Watson, Crick, and Wilkins received the Nobel Prize in Physiology or Medicine for their work on the structure of DNA. Due to the Nobel organization’s rules, Franklin was ineligible for the prize because winners may not be posthumous. While Rosalind Franklin has been subsequently recognized many times over for her work on DNA structure, many see the Nobel as the ultimate form of recognition in science. Some even speculate that her cancer may have been the result of the very radiation she used in her studies. In any event, Rosalind Franklin is both a tragic and celebrated part of science history.